While the majority of students have success during their time at CDL training with Driver Solutions, there are others who come up short in their quest to become a professional truck driver. Over the last 24 years, Driver Solutions has been helping inexperienced drivers develop the skills needed to get a CDL and find a truck driving job. During that time, we've seen it all – tremendous successes and horrible failures. But really the difference between the successes and failures all comes down to four main mistakes. So, why do they fail? And how can it be prevented? One of the biggest problems that truck driver training students face is that they do not fully understand what the career entails. There are times when students come to school just looking for a better paying job without being fully committed to a new career. As Brett Aquila mentioned in his popular blog post Surviving Your First Year On The Road, trucking is more than just a job - it's a lifestyle. Many students enter school without realizing they are going to start off as an over-the-road (OTR) driver. This means they will likely be away from home for a few weeks at a time. It IS a lifestyle change that no one can deny and it must be one that the student is ready to make. It's really simple – gather information and plan ahead. Aspiring truck drivers need to make sure they understand what the trucking lifestyle is like prior to committing to training or going to work for a trucking company. It should not be shocking to find out that you're going to have to make adjustments and you're going to be away from home. There are plenty of websites, such as TruckingTruth.com, truck driving blogs (like this one) and other resources available with tons of accurate, helpful information. Take advantage of this information and if you aren't sure on something – ask questions! In addition to looking online, it never hurts to talk with some truck drivers who are actually living the lifestyle. 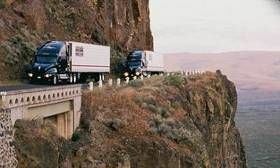 Now, you do have to be careful when doing this because trucking has its fair share of complainers (ya know, the people who will never be happy and nothing is ever their fault), but it also has some good professional drivers who will tell it like it is. After you have a better understanding as to what it's going to be like, you need to plan ahead. Talk with your significant other, your family and your friends. Make sure you get the support needed to move forward with your decision. And a word from the wise: after you've signed a one year contract with a trucking company is not the time to tell your wife you're going to be gone for 3 weeks at a time! You may laugh, but it happens. We've got news for ya ... truck driver training is not going to be easy. If a student expects that learning how to drive an 18 wheeler will be a cake walk, they're in for a big surprise. While it may look like all you have to do is drive, there is so much more to it. Truck drivers also have to plan their trips, complete log books, do pre-trip inspections, all while staying up-to-date on state and federal regulations. The bottom line is that becoming a true "professional" truck driver is a lot of work, but with hard work comes great reward. Keep your eye on the prize, make some new friends, and go get it! While CDL training can give a student the resources needed to start a trucking career, ultimately succeeding comes down to having the right attitude and work ethic. Potential truck drivers need to come to school ready to learn, study, and ask questions. Remember, you are at training for a reason – you must think it means a better life for you and your family. Don't lose sight of that. It isn't easy to start a second or third career in your mid-forties. So, if you hit a slump don't forget to take a breath to remind yourself why you're at training and what the end result can be – the ability to provide a better future for you and your family. Take some initiative. Make some new friends. This is another bit of advice that will help greatly when it comes to truck driver training. You are going to be going through training with other students who you know are just like you in at least one way – they want to become truck drivers too! Now take this information and use it to your advantage. Make friends with other students and form study groups. Studying with a friend for certain aspects of training such as the pre-trip inspection can make a world of difference. We've seen all types of study groups, including a group of eight students who became so close they called themselves "family." 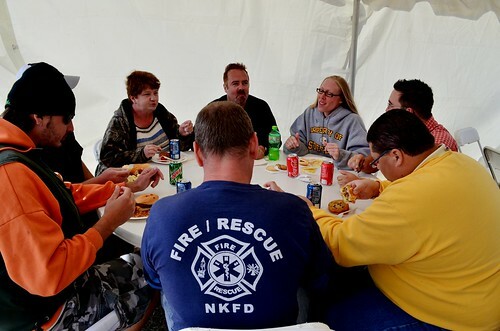 Check 'em out in this Flickr Album at our Truck Driver Appreciation BBQ. Not only were they successful at training, they were also successful in creating lifelong friendships. One last thing, while we cannot speak on behalf of all truck driving schools, most equipment (trucks) used by Driver Solutions are available after hours for extra practice. In addition to that, we've got checklists, DVDs, etc. available to accommodate any type of learning style. All of the resources are there, so soak up the knowledge and make the most of it! Unfortunately, students often go into truck driver training with bad habits and attitudes. They may not like to study, or they may not like to be told what to do. It is important that students enter training with a clean slate. Being a "Mr. Know-It-All" will not get you very far in learning how to drive a semi. And, while your Grandpa may be a great person, it may not always be best to practice driving techniques he taught you 15 years ago. It's important for truck driving students to realize that the other students and trainers at school are there to help. No truck drivers, not even the most experienced ones, know everything. Every day should be a learning experience for a trucker, even if it's something small. A truck driver with over 20 years of experience once told us, "the day I think I know it all is the day I need to quit driving" and that couldn't be more accurate. It's really that simple. Again, while we cannot speak on behalf of all trucking schools, Driver Solutions has a proven method of CDL training techniques that work very well. Our instructors have experience and many of them are even past graduates (which means they've sat in the same seats our students sit in). They know what you're going through and know how to successfully teach you the skills you need to get your CDL license. See them as the incredible resources they are rather than trying to show you may know more than they do. Driving a truck for the first time can be intimidating, scary, and overwhelming (sometimes all at the same time). It can be easy to get frustrated when something like backing up doesn't come easy to you. Unfortunately little setbacks can build up in your mind and this can cause some students to give up before truly giving themselves and/or the trainers an opportunity to succeed. The good news is you are not alone. Plenty of others have struggled and plenty of others have successfully overcome those struggles. 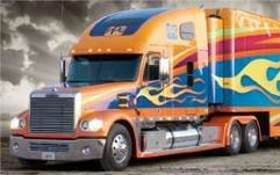 Is becoming a truck driver something you truly want? Do you think it can create a better life for you and/or your family? If you answer yes to these questions, then you've got reason to continue on. Never lose sight of that. While setbacks may have you feeling down in the dumps at times, we promise the feeling that comes with holding that CDL license for the first time makes it all worthwhile. We'll never forget interviewing Matt right after he stepped out of a semi for the first time. He was still shaking. Instantly things were running through his mind – mistakes he'd made and things he should have done differently. He started beating himself up a bit and lost sight of the big picture – this was his first time driving a semi! While he never considered giving up, he was a bit frustrated and it was easy to see. Then he remembered back to the pre-trip inspection. You see, it took him awhile to get the pre-trip down but he finally did it by repeating the steps over and over to himself. He'd find a nice quiet spot at school where he could focus on each and every point. Once he realized this was the best way for him to learn, he began talking aloud while practicing on the range. He'd tell the instructor what he was doing while he was doing it, allowing him to think through things such as shifting gears or backing up. Soon things began to quickly fall into place for Matt. We interviewed Matt again the day he got his CDL and could tell it was one of the happiest days of his life. He'd already called most of his family and he was grinning ear to ear. He told us about the sense of accomplishment that came with knowing he'd overcome his struggles. He told us how he couldn't wait to get out on the road so he could start seeing the country. But most importantly, he told us how he was so happy he kept going and refused to give up.